These colorful Stained Glass Dragonflies on a wall-hanging are sure to warm your heart as a reminder of your love of Dragonflies! They appear quickly, often in vibrant colors and love to bask in the sun! They can fly straight up and down or hover like a helicopter then just as quickly they disappear! 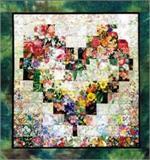 Kits include pre-cut watercolor fabric squares, applique fabrics and detailed pattern along with border fabrics. 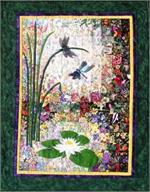 You can make borders rectangular for runner or quilt, or as a wall banner as shown. 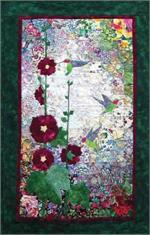 Size is approximately 16" x 44"